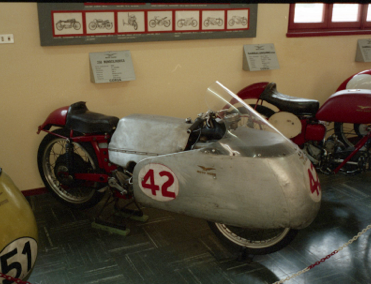 The museum is located in Mandello del Lario, on Lake Como, at the factory. It has practically one of every bike they made, and more importantly, the famous racing bikes – including the 4 cyl and V8 500 cc GP bikes of 1955. Amazing variety and history to be found. 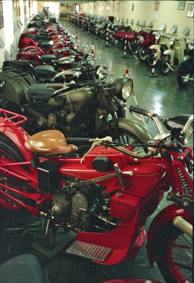 Guzzi Gallery. The images are a bit rough, scanned from old negs, with dust, to remind you of the simple settings and light of the way museums used to be. Best to call for hours before going. When I went, it was open every day but only at 3 PM! its well worth a visit. Patrick Bedard did a wonderful Cycle article on this museum as “The Racer as Tourist” in the 1980’s, and captured its remarkable aura. There was a 500 cc V8 motor on display, along with the bike it was in. 1955 was a good year.A memorable experience to be sure.